Cycle Chic®: Who's The Bosch? Transporting a power drill has never... ever... looked this elegant. 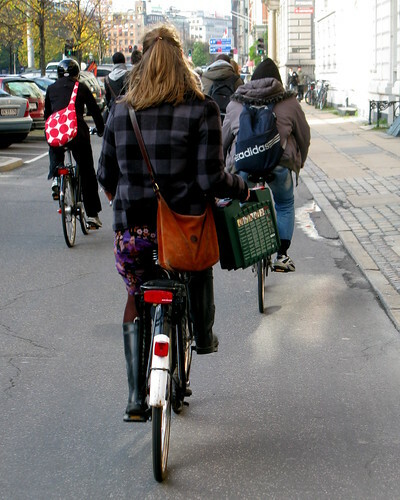 Regarding an earlier post about Copenhageners eating and especially drinking coffee on their bikes, one of our readers fired off this link to us. "It may seem unlikely, but simply clutching a warm cup of coffee can bring on a flood of warm feelings, U.S. researchers said on Thursday in a finding that suggests a strong link between physical and emotional warmth. "Physical warmth can make us see others as warmer people, but also cause us to be warmer -- more generous and trusting -- as well," said John Bargh, a professor of psychology at Yale University in Connecticut, whose research appears in the journal Science." And here's a cracking photo series from Travel & Leisure about Copenhagen cycle chic. Is that Spotty Dotty on the left really wearing a helmet in Copenhagen?? Must be a tourist.